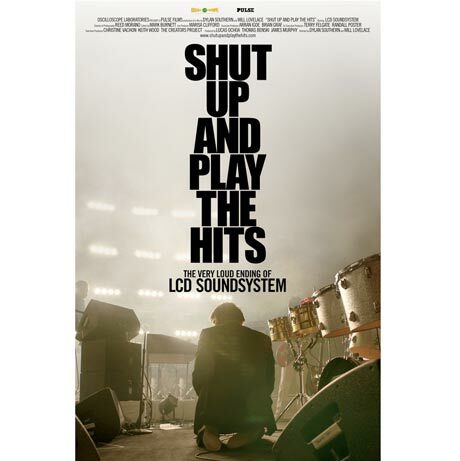 Earlier this year, LCD Soundsystem premiered their documentary film Shut Up and Play the Hits at the Sundance Film Festival, but it won't be long before you can check the movie out in the comfort of your own home. As FACT points out, the flick hits retailers on DVD and Blu-ray October 9 through LCD main man James Murphy's DFA imprint. It had been long-hinted that the set would arrive on DVD, but Shut Up and Play the Hits ended up hitting the film circuit for a very limited engagement beforehand. The film, which chronicles the band's final performance at New York's Madison Square Garden in April 2011 and its aftermath, will arrive as a three-disc package. The first disc will contain the Dylan Southern and Will Lovelace-directed concert film, while the other two discs will features the audio tracks from the show. A write-up for the product hints that info on some "surprise extras" that will also be included throughout the set is forthcoming. In the meantime, unless you already caught the film on the silver screen, you can check out what the film's all about in the trailer down below.